Rutherford celebrates 10 years of service. 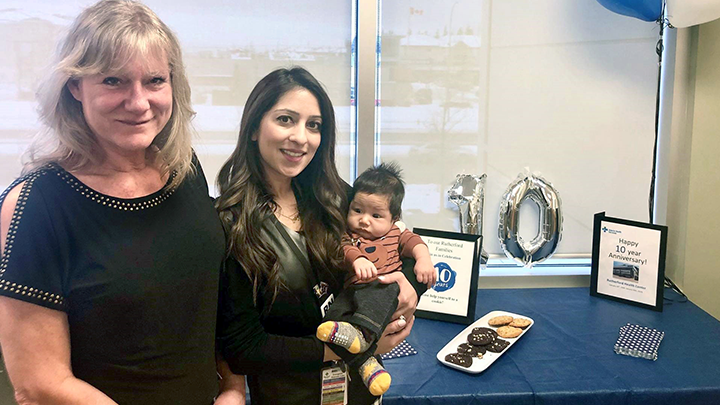 Site secretary Michelle McClenaghan, left, and Healthy Young Families program Registered Nurse Alyna Kara have been with the Rutherford Health Centre (RHC) since it opened 10 years ago. Their cherubic visitor, baby Marlo, numbers among the centre’s newest clientele. For a decade the centre has proven vital in creating healthy communities in southwest Edmonton. EDMONTON — What a difference a decade has made for Rutherford Health Centre as it marks a milestone since opening its doors in 2009 to serve and grow alongside Edmonton’s flourishing southwest community. Today the centre provides a variety of services including programs for new mothers and babies, such as the Healthy Beginnings postnatal program, prenatal classes and New Mom’s Network series, along with immunization services and school health services. In addition, the Children, Youth and Families Mental Health and Addiction clinic opened in 2016, providing mental health and substance use services for children, youth and their families. “It has helped in increasing access to health services in that corner of the city,” says Selene Tash, Executive Director of Community Health Services, Edmonton Zone. When it launched, “it was kind of this lone-standing building in this empty field and there weren’t many services around,” reminisces Alyna Kara, who has been a nurse with both the School Health and Healthy Young Family programs since the centre opened. Despite its ‘lone-standing’, the centre has proven itself vital to the growing southwest population, with many young and newcomer families. In its first year, the centre’s Healthy Beginnings Program saw 763 clients, a number that grew to 1,583 clients in 2018. Its Well Child Clinic administered 15,641 immunizations over the last fiscal year, with 17,603 immunizations administered already this fiscal year. “I’ve been with the Rutherford team for the past four years, and in that time the growth to the area has been phenomenal, from our ever-increasing birth rate, to the opening of 11 new schools, south of the Henday, over a two year period,” says Patty Lemay, Operations Manager. Staff recall the H1N1 influenza campaign of 2009, which saw to 11,816 clients immunized with the H1N1 vaccine in the first week alone — and another 3,165 clients immunized with the seasonal flu vaccine that week as well. Credit for the centre’s ability to handle such a high patient volume goes to its hard-working staff. As the centre celebrates its 10-year anniversary, its team is already looking to the future with a renewed commitment to further grow and improve healthcare in city’s southwest.